This post continues my ongoing series on the evolution of the Inner Arbor plan for Symphony Woods, this time looking at the Chrysalis amphitheatre. Contrary to the conclusion of my last post, I’ve decided to hold off posting about the Merriground and the Merriweather Horns until after the design advisory panel meeting. Instead I wanted to go back to one of my earlier Inner Arbor posts and revisit the topic of the Chrysalis amphitheater. At the time I wasn’t entirely clear how the flowing shapes of the Chrysalis were to be constructed; I wasn’t even sure what material the Chrysalis was to be made of. Now I have a much better idea of what’s going on with the structure, and wanted to pass that information on to you, my readers. Architectural Record’s annual Design Vanguard issue brings together the architects who are already doing some of the most innovative work in the field and will lead the profession in the future. They are the firms at the forefront of design and the architects are the ones to watch. This harks back to a point I made earlier about the Inner Arbor design team: From my perspective a key goal in putting together the team was/is/should be not to pursue a laundry list of current “household name” architects (including having Frank Gehry revisit Columbia fifty years on), it’s to find talented architects who are doing exciting things and are poised to break out to greater fame, and then give them the opportunity to help achieve that fame by designing something significant for downtown Columbia. In my opinion Marc Fornes and THEVERYMANY are very much in that mold. If you look through the feature Architectural Record did on him and his firm, and especially the accompanying slideshow, note that his works thus far have mostly been relatively small-scale and almost experimental designs, many closer to sculpture than to traditional buildings. The Chrysalis is the first large-scale commission for THEVERYMANY and could be a landmark in the firm’s evolution. Now, back to the details of the Chrysalis itself. Fornes has constructed previous structures out of small pieces of aluminum (or, for some structures, carbon fiber or plastic) cut from larger sheets using computer-controlled machines (so-called “Computer Numerical Control” or CNC systems). These pieces are then riveted or bolted together to built the structure, with a given structure containing up to several thousand of such pieces. In many cases submodules of the structure are constructed independently and then joined together at their seams. For examples of the process see the slide show referenced in the Architectural Record feature, for example, slides 2 through 5 describing the Double Agent White structure, or slides 16 to 18 showing Y/Surf/Structure. See in particular slide 17 showing a close-up view of the riveted pieces of one small section of Y/Surf/Structure; note that pieces of different colors are used to produce colored stripes on the completed structure. Structural model of the Chrysalis at 1/15 scale. Click for a higher-resolution version. 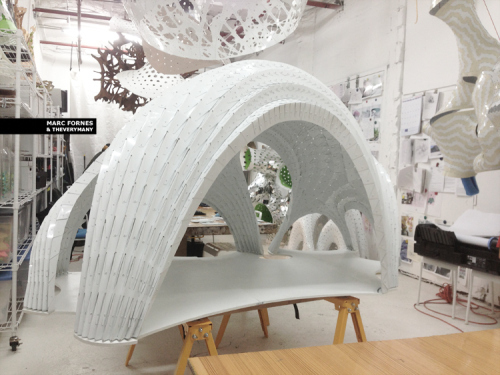 Image © 2014 Marc Fornes; used with permission. As shown by a 1/15-scale structural model created by THEVERYMANY and depicted on its web site, the Chrysalis will be constructed in a similar way. From a distance the Chrysalis model appears to have a smooth (or almost smooth) surface. However as you get closer you see that the model is composed of multiple small pieces, each consisting of what appears to be an initially flat element (presumably cut from a larger sheet together with other pieces) that is then creased in multiple places. (Viewed end-on each piece would then have an appearance similar to the letters “W” or “M”, albeit more flattened and with perhaps more creases, or like a section of a corrugated metal roof.) Flaps extending from the lower side of each piece are then riveted to the upper side of the piece below it, with that piece in turn being riveted to the piece below it, and so on until you reach the ground. The bottom pieces then attach to the foundation of the structure (in this case, the Chrysalis stage). Detail of the Chrysalis 1/15-scale structural model showing individual pieces. Click for a higher-resolution version. 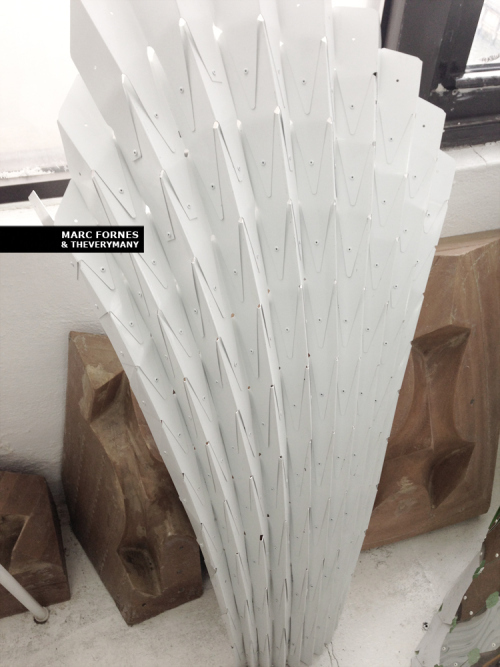 Image © 2014 Marc Fornes; used with permission. The close-up view appears to show between a few dozen and a hundred or so pieces; the estimate depends on the size of each piece, which is difficult to tell in the image. The close-up shows just one leg of the overall structure; the entire Chrysalis could contain from several hundred up to a few thousand pieces, again depending on the size of each piece. Although I can’t recall where I read this, my understanding is that the pieces of the Chrysalis are to be made of aluminum; the structural color effects shown in the original Inner Arbor images would then be achieved by painting each piece a slightly different color. In the lower parts of the Chrysalis the difference in color between adjacent pieces would be relatively great, producing pronounced horizontal stripes of color. In the upper parts of the structure the color of the pieces could become lighter and the differences between pieces could be made less pronounced, producing a more subtle gradient of color. Previous Fornes structures were assembled by small groups working with simple tools, but the Chrysalis would call for heavier equipment. As noted above, some previous structures were assembled first into subcomponents that were then connected together; it’s not clear whether that would done for the Chrysalis or whether the structure would be assembled piece by piece on site. In any case the construction of the Chrysalis will be like assembling a large 3-dimensional jigsaw puzzle; I look forward to seeing it come together. A final thought: I mentioned in my earlier blog post that the Chrysalis is computer-generated and not just computer designed: It is the end product of sophisticated algorithms created to explore complex new 3-dimensional forms and then translate them into buildable structures using advanced computer-driven manufacturing techniques. It’s a cliché of populist art criticism to say “my kid could have done that”. Well, I think it’s highly unlikely that your kid could have created something like the Chrysalis, not to mention other even more complex Fornes-designed structures. However in this time of increased emphasis on STEM education I also think it would be a great idea to have students learn about simplified versions of the techniques Fornes uses, perhaps as part of the HiTech initiative sponsored by the Howard County Library System. They might learn some skills that would stand them in good stead in the 21st century workplace, and at the same time gain a greater appreciation for the design achievement that is the Chrysalis.